When we talk about God’s grace it is defined as unmerited favor. Something we are given by God in abundance even though we don’t deserve it. God’s grace is what allows us into His presence. We mere mortals are invited by the creator of the entire universe to hang out with Him. Chew on that for just a second. So how come we don’t show each other more grace? This thought, witnessed all too often every day, became a thorn in my side. A few years ago I had a thought. A passing, fleeting thought that morphed into a vague idea that sat at the back of my mind and slowly marinated while I went about my life. As time went on this idea grew into something with a little more form, but it was still hazy. Not until I quit my job did the plan come into view. Develop a website with monthly posts from a bunch of writers at different life stages with different viewpoints who write on the very same subject each month. Once the concept was born I began assembling my team and working on a title. Turns out that gathering a writing team is much easier than figuring out what to call a website, but the word “grace” kept niggling at me. When talking to his disciples, Jesus told them to love one another so people would know they were his. (John 13:35) He didn’t say, “Unless you don’t agree with them. Then by all means, be as hateful and rude as you’d like.” And yet I continually see Christians treating each other less than kind because of a theological difference of opinion. It doesn’t stop there, though. We are also told to respond to non-Christians with grace, something that escapes so many Christ-followers. Not only do many Christians respond to fellow believers with hatred and vitriol, they respond to non-Christians in the same way. So not Christ-like. So not kingdom-building. So not cool. This idea of grace will gush from this website. I want women to realize that this gift of grace is for every one of them as much as anyone else. I want our writers to be gracious towards each other when their doctrine doesn’t align. I want our readers to see grace played out in the articles and the conversations. On this website, I want the idea of grace to be walked, not just talked. And that’s what “Grace” has to do with it. I just figured “and Such” would cover everything else. So my thought became an idea that turned into a plan that is now a website about grace. And such. 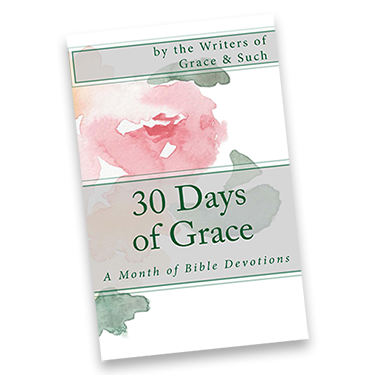 I hope everyone – the writers and the readers – enjoy learning from each other how to walk out this precious gift called grace – and such – in their own lives. So what does “grace” mean to you? So honored to be gleaning from you and the other writers on this page. You nailed everything that’s been niggling at me, too. Thanks also for the opportunity to share here. Grace…in today’s vernacular…would be cutting one another a break AND not expecting it to be returned. Gosh, we need more of that- and “we” need to be giving more of that. Meaning me. I. And to do that, of course, we…I…need more Jesus. Every day. More Jesus. Every day. Yes! Love the whole idea of walking the talk. It’s so easy to say ‘love each other’ and ‘show grace to everyone’ but SOOOO much harder to actually make that a reality in your life. So excited to be a part of this, and learn from each other! Thanks, Jen, for making your idea come to life for all of us! Thanks for coming along with me!! Love this idea and looking forward to reading and learning! show each other more Grace! Thanks for this website, sharing your thoughts about grace and the struggle to be what we profess to be. Congrats on the site! To me it means not having to be perfect. It means that God is kind of the filler when the wooden legs of my life gets chipped. I just can’t do it alone and grace gives me the strength to go one day at a time. Thanks Andrea! And I love your analogy of the wood filler. YES! I watched a clip on Facebook the other day and the preacher said: “You can’t Evangelize and Antagonize at the same time.” That really struck a cord with me, so many times we forget that. Here’s hoping that we Christians remember the grace we’ve been given and learn to share…. with grace. “can’t evangelize and antagonize at the same time.” It’s just common sense, but so easy to forget. Jennifer, well done. I look forward reading more…thank you! I’m really excited about this website. Walking the talk is something that everyone struggles with, but I have found that the more I read the Bible, the more I read Christian based articles, the more I surround myself completely with Jesus, the more I am able to walk the talk. The more I am able to apply the teachings. Thank you Jen. You are a fantastic writer on your own and I’m really looking forward to reading articles by the rest of the team. You are truly an inspiration.